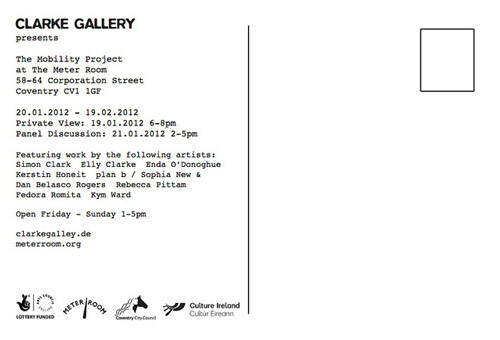 This is a reminder that The Mobility Project opens this Thursday and runs until 19th February. And that on Saturday (21st January) from 2-5pm the Panel Discussion takes place, consisting of a performance, presentations, talks & discussions with all exhibiting artists plus guest speaker Janneke Adema and Alfredo Cramerotti as 'Curator-in-Action' for the day. 2. "Meta-meat-mobility" - 30 minute performance by Kym Ward. Performance about the relationship of the body to an idea of mobility, the limitations of the body / personality under the demands of intellectual labour. 4. "Mobilising Loss" 15-20 min presentation by Simon Clark Discussion of the artist's postcard project in relation to the rest of his practice and the space of imagination. Via Walter Benjamin, Holbein's Dead Christ and Simon Clark's song/video I go to church to count the pews. 7. plan b will talk about their practice of recording everywhere they go with a GPS and delve through some of their data to show what rubbings they are making of cities and how their tiny scribbles on earth have come to be the drawing of their lives. 8. Elly Clarke - short discussion of Clarke Gallery and mobile exhibitions, leading to open discussion. The event is free to attend and all are welcome! However, due to details such as number chairs and cups for tea etc, an RSVP would be appreciated: mail@clarkegallery.de. 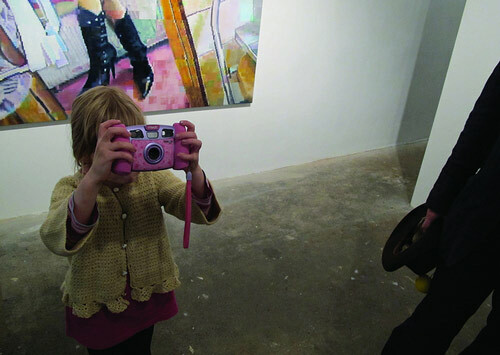 Also - please dress up warm as the gallery can be chilly! Once again, we are very grateful to Arts Council England, Coventry Council Small Arts Grants and Culture Ireland for supporting this project. Press release for the exhibition follows. It would be excellent to see you there! Clarke Gallery is delighted and honoured to bring The Mobility Project to the Meter Room. This is the second stop of this exhibition, which began at Galerie Suvi Lehtinen in Berlin. We are extremely grateful for the support of Arts Council England, Coventry Council and Culture Ireland - without which this exhibition - and all artists - could not have come to Coventry. "Keep connected, you are never alone, never alone with a mobile phone in your pocket." Over the last decade, particularly since the mass take-up of the mobile phone, the ever-increasing mobility - of people, goods, information and images - has radically altered the way we perceive, interpret, navigate and even describe the world. Notions of presence and absence, solitude and togetherness and even of geography are changing as our personally tailored collections of contacts, communities, photos and politics are with us 24/7. The way we travel around the places we live in, and how we interact with others whilst we're there, has a great impact on the way we understand not only where we are but also who we are. Communication and movement are, and always have been, closely linked, dictating the scope of our influence. But today, in a world where one tweeted photo can be seen across five continents within seconds, that influence can reach areas and cultures of which we have no concept. This exhibition presents seven different projections of mobility. From Simon Clark's epic cycle journey around the UK delivering postcards he picked up from the Galapagos Islands direct into people's hands to plan b's live redrawing of their GPS traces gathered (and redrawn) day by day during visits to the UK over the past few years direct onto the gallery wall; from Enda O'Donoghue paintings created from low-res mobile phone photos found on the internet to Kerstin Ho! n eit's multi-city performance-experiments where she instructs women to stand on the same area of pavement for fifteen minutes; from Fedora Romita's audio recordings of the U-Bahn network of Berlin as a means of getting to know the city she just moved to, to Rebecca Pittman's two screen video installation of her journey along a featureless road in the states listening to driving music and finally from my own five minute video showing an unexpected moment of stillness on the German Autobahn to Kym Ward's performance - these are personal portraits of navigation. But, between them, they touch on wider issues that affect us all as we negotiate our way around the world - including gender, power, surveillance and the relationship between physical and virtual materiality. On 21st January at 2pm a panel discussion will take place in the gallery, featuring all the artists in the show plus guest speaker Jannke Adema and Alfredo Cramerotti as Curator-In-Action. There is also a specially commissioned set of prints by all exhibiting artists, starting at �85 - the sales of which will support the artists, the gallery and this exhibition's onward journey. Many thanks to Dan Pryde-Jarman of Meter Room, Daisy Ware-Jarrett, Genea Bailey and all artists. Elly Clarke is an artist & curator based in Berlin and Birmingham, UK. Next stop for Clarke Gallery is as part of the Allotment project at mac, Birmingham.